On these beautiful days of spring, thoughts go to those pointy treats poking their heads up as the days get warmer: asparagus! But they have not always been good thoughts. 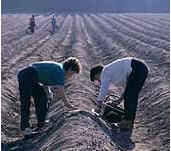 Growing up near Hadley, Massachusetts, the self-proclaimed “Asparagus Capital of the World”, meant eating it, a lot, in the season. Cooked to death, never peeled, this asparagus was vile, its acrid flavor reminiscent of the abominable olive green stuff in cans. It was not until years later, when I had properly cooked asparagus for the first time, that I realized what all the fuss was about and became an asparagus lover. In these days of globetrotting foods, we can get very good fresh asparagus all year round, but well traveled asparagus simply is not as good as the fresh product available from farmers’ markets or, at the farm stand, harvested in the morning and in your pot later in the day. 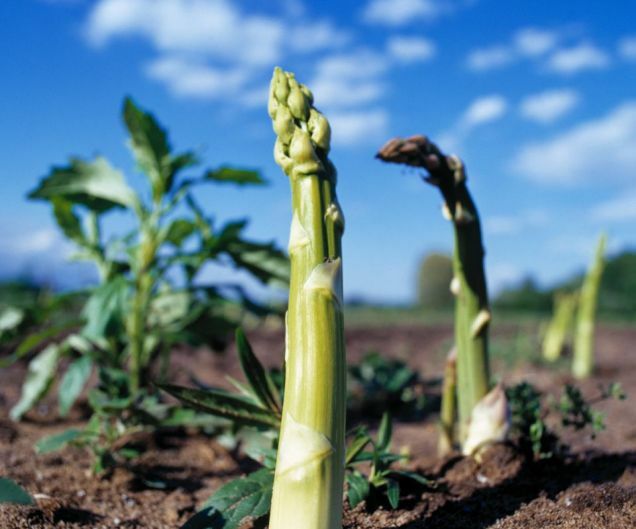 Native to the Middle East, asparagus inspires festivals every year throughout Europe, where white asparagus is the norm, versus the green which is most popular in the United States. I remember the beautiful market around the cathedral in Freiberg, Germany, during asparagus season, known as Spargelfest: Bins heaped high with white asparagus of varying thickness and purity of its whiteness, all at different prices, and the shoppers presumably knew the difference among them. Restaurants mirror the market and the home cooks in presenting special menus, for example three courses comprising asparagus soup, asparagus with hollandaise sauce, asparagus with ham. It’s a reminder of what life was like before everyone took favorite vegetables for granted year round, and when they feasted on short-lived seasonal treats. Lufthansa even offered a Spargelfest menu in transatlantic First Class that week, and it was delicious, all things which could be easily prepared in flight and really tasted good in the stratosphere (a novel thought). Getting closer to ground, green and white asparagus are both easy to prepare, although need to be approached differently, and occasionally you’ll find purple (an expensive novelty). 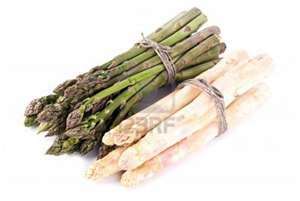 One myth is that thin asparagus is tenderer than the thick. Not so. They have the same number of membranes, and so the toughness is more concentrated. The stalks are thickest at the start of the harvest, which ends when the spikes become so thin that they are like grass, left to mature for the summer, to reemerge the following spring. All asparagus needs to be trimmed at the bottom (there are two schools of thought: the snappers and the cutters); my approach is to look for where the woody part starts and cut. Green asparagus benefits from being peeled, but just the lower half, and cooked only a few minutes until tender. 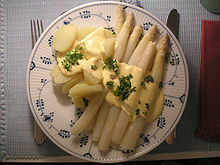 White asparagus is much woodier, and requires both trimming the bottom and nearly complete peeling, difficult as it breaks easily, and takes longer to cook. You don’t need a fancy vertical asparagus cooker. 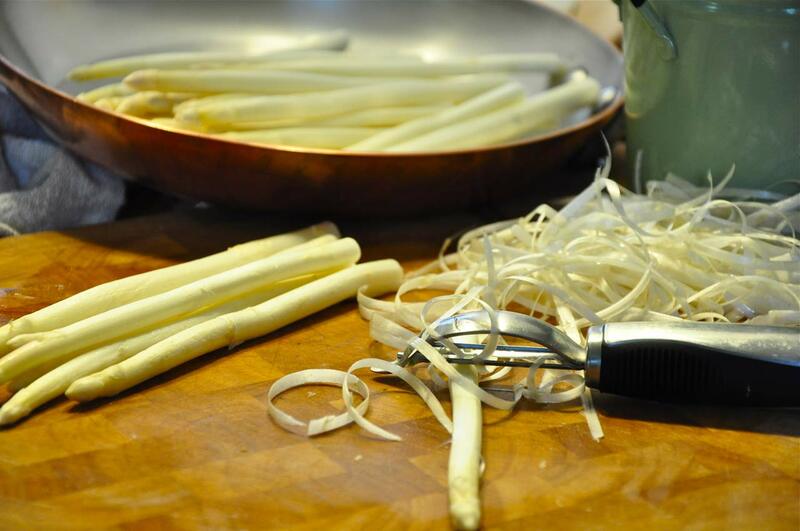 I use a wide, shallow pan with an inch of salted water, boil the whole stalks horizontally (makes for even cooking and less leeching of flavor and nutrients), dump into a colander and shock with cold water. Then it can be served whole or cut into bite-sized pieces for salads or to be reheated for a few seconds in butter or olive oil just before serving. However you cook it, boiled, steamed, roasted, grilled, asparagus is delish year round, and a special treat if you live in a place where they pop up fresh. The plants in the first photo look like dinosaurs! I love asparagus, and have it frequently at home. I throw the peelings and woody ends into the stock pot. As for green vs. white, personally I always go for the green. Chlorophyll has health benefits, and maybe this is just psychological bias, but the white stuff looks like it’s depleted of nutrients. I feel the same way about white eggplant, not to mention white flour and white potatoes. Isn’t it true that the darker veggies have more antioxidants? What a great post! Just right for this time of year. I love the white and while I knew they grow it without sunlight, I never really saw it being farmed. MEG: your blog gets better and better. How about one on Shad Roe or soft shell crabs? Good story again. A wonderful way to cook asparagus is in the Microwave. Place the ready to cook stalks in a suitable elongated dish, add a few drops of water (not more), cover with plastic wrap and cook. How long depends on the thickness of the asparagus and the power of the microwave. If not cooked enough you can always zip it a little longer. Basically you cook the asparagus when you sit down for dinner, by the time the main course is on the table the asparagus is ready. Enjoy!